Smith Street Books, 9781925418200, 136pp. Get your freak on with these insane shakes! Is it a dessert, is it a drink? No, it’s a freakin’ monster shake! Here you’ll find fifty over-the-top and out-of-this-world milkshake recipes (including a whole bunch of dairy-free options) that will wow, shock, likely give you diabetes, and make you the most popular Instagrammer among your friends. These overindulgent dessert sensations are not for the fainthearted. Filled with delicious sugary goodness, there are no rules and no limits to what can be added: cupcakes, muffins, donuts, and pretzels are all fair game, not to mention sauces such as dulce de leche, salted caramel, or rich chocolate glazes, all garnished with more of the above and a delicately placed straw that really serves no use other than to remind you of the fact that this is, actually, a humble milkshake in disguise. This book is perfect for those who love indulging in the sweet stuff, so grab your mason jar, fill it until overflowing, dig in, and die from happiness. Vicki Valsamis is one of Australia’s most sought-after food stylists and recipe developers and has worked with major brands, food magazines, and publishers. 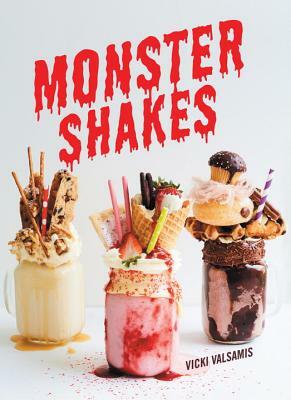 Monster Shakes is her first book.